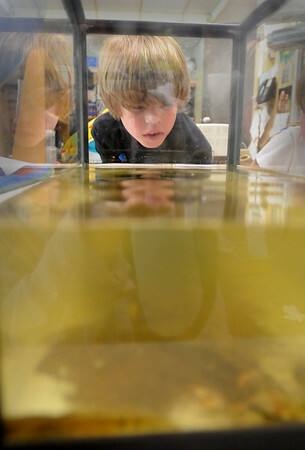 Amesbury: George Miller, 8, scans into a murky fish tank looking for tadpoles to write down observations of the amphibian in Cathy Patten's class at Amesbury Elementary School. They observed the small legs as the tadpole grows into a frog as they learn about life cycles. Bryan Eaton/Staff Photo Newburyport News Tuesday May 26, 2009.